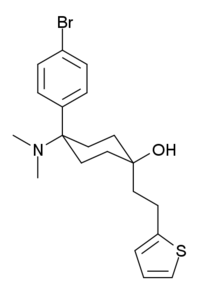 C-8813 (thiobromadol) is a potent μ-opioid receptor agonist with a distinctive chemical structure which is not closely related to other established families of opioid drugs. The trans-isomer was found to be around 591 times more potent than morphine in animal studies. The same study assigned a potency of 504 times that of morphine to the related compound BDPC. C-8813 is claimed to be similarly potent at the δ-opioid receptor, which antagonizes the mu depression of breathing, presumably making the drug safer. C-8813 has never been used in humans. 1 2 Liu, Z. H.; Jin, W. Q.; Dai, Q. Y.; Chen, X. J.; Zhang, H. P.; Chi, Z. Q. (2003). "Opioid activity of C8813, a novel and potent opioid analgesic". Life Sciences. 73 (2): 233–241. doi:10.1016/S0024-3205(03)00263-7. PMID 12738037.